The road to Johnson Valley high desert passes through a few small towns. Smaller and smaller, until there’s just one store. And it’s closed. There are a few homes outside of town… then a few abandoned trailers… then nothing at all. Beyond that, there’s the place Forrest calls home. The Compound resembles a scene from Mad Max: a ramshackle outpost of scattered structures and curated debris. Forrest and his dad call it the “what-you-got construction” style, inspired by the scavenger aesthetic of Baja, California. Everything on this high-desert property has a story. Some from previous lifetimes when the property was an illegal grow operation. Others salvaged from back alleys of Huntington Beach or yard sales between here and nowhere. Back in the “real world” of Huntington Beach, Forrest’s dad Mike is a respected surfboard shaper. A humble priest of the sport, underpaid and wholly devoted. In an age of foreign pop-outs and Walmart foamies, Mike builds his boards entirely by hand, even doing his own glasswork. Despite his longstanding reputation, it’s a hard way to make a living. So their tumbledown shaping operation in the desert offers respite from the distractions, inflations and restrictions of the city. This is the Wild West. They come here between swells, to wait out the tides of life and disappear into the dust. Out here, hours from the ocean, he taught young Forrest to shape surfboards. And he bought him a bike. The rest was up to the desert. “We didn’t have any internet or phones out there,” says Forrest. “Just this one VHS copy of On Any Sunday that Bruce Brown gave my dad. That movie pretty much became my bible. By day, he’d ride. First, endless circles around the camp. Then, way, way out on his own. Earning it the hard way. Breaking down or getting lost, then pushing home across miles of sand to start again. Once, on a remote dune, he went over the bars and broke his arm and leg. With his little YZ80 too mangled to ride, all he could do was lie there helpless in the sand. In the sun. Eventually (miraculously), a random dune buggy came along and saved his life. From a young age, he spent half his year in Costa Rica surfing and the rest in California riding. But over time, his two-wheel obsession consumed him. He rode, mostly alone. He rode a lot. Pushing his limits across the empty wastelands. Progressing for no one to notice. His talent never added up on paper. He qualified for the Loretta Lynn’s at an early age, but couldn’t afford to attend. Sometimes he’d ride on his own out to compete in the local Hare & Hound events. 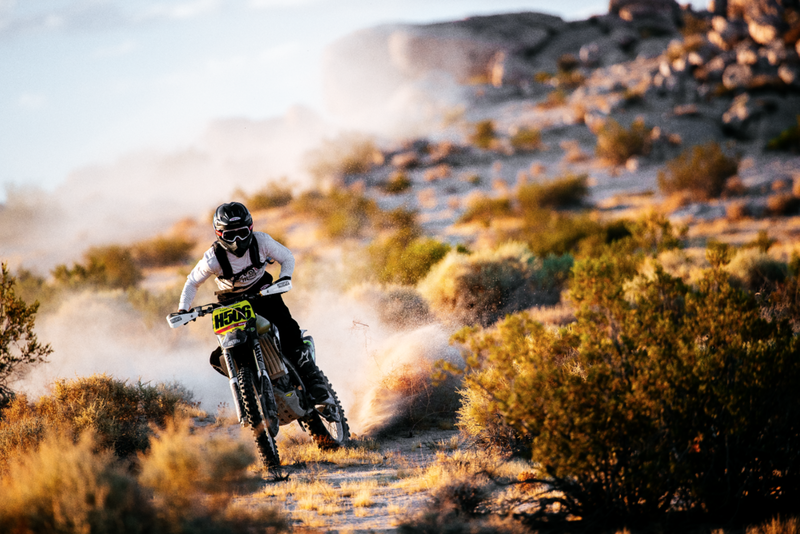 It was a 5-mile ride from the compound across the desert just to reach the start line. He did well in those events, but what did it mean? Forrest was better off pushing his luck alone. His solitary communion with the dust. He rode everything. Different bikes for different feelings. Dad’s vintage bikes on the turn track around the compound; a TT Flat Tracker for the dry lake bed; his beloved custom 2005 Honda CRF 450 that he bought for $800 and built specifically for the desert; or his modern-day 450 for the MX Track. Like his long-gone heroes from On Any Sunday, Forrest’s riding transcends genre. Different tools for different jobs. In 2015, he competed in the Baja 500 as part of an all-Mexican racing team. Dad was his crew. No rig. No chase car. No radio. No GPS. They camped out for the pre-race training weeks and survived until the main event. “That’s the hardest thing I’ve ever done,” says Forrest. 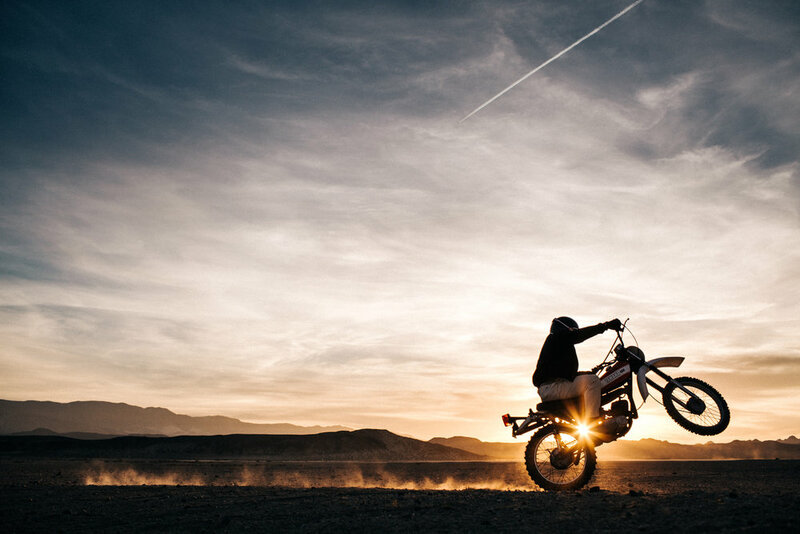 “We were going pretty good until the bike blew up.” Just another day in the desert. he surfing caught up to him again. Eventually. All those boards. All that shaping. All that dust. They’d stay in the desert just to wait out the swells. Dry their gills. Then back to the beach to deliver the boards, score some waves and reconnect with humanity. Forrest shapes like he rides, defying the genres that cuckold the sport. He’ll shape a high-performance shortboard one day and a down-rail log the next. A classic fish or a hybrid single fin. Different tools for different jobs. It’s all about chasing a feeling. These days, the surfboards spend more time than ever underfoot. 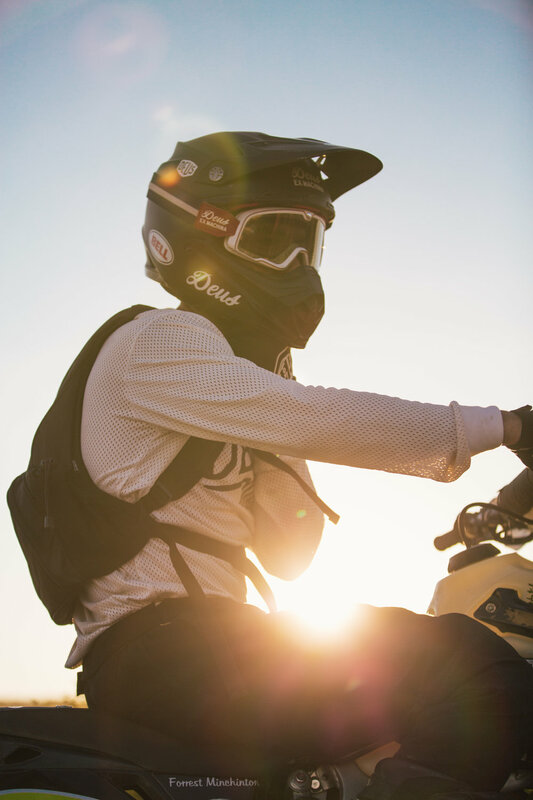 Aside from his yearly sojourns to Central America, Deus Ex Machina has been taking him surfing around Indonesia, Australia and Japan, while his moto skills help lead their surfer/riders deeper into the jungles and uncharted coasts. He’s expanding his horizons. Discovering new dreams. Evolving. But the desert remains unchanged. Unevolved. Timeless. And it’s here that Forrest always returns. The trips get longer. The leaving gets harder. He wonders sometimes whether he shouldn’t just stay there full-time. No, not yet. That’s not his line. The shadows are leading him elsewhere. More flat track racing. The Baja 1000, perhaps. More Indonesian treks, for certain. Japan. Europe. Australia. The desert travels within him. A frame of mind. An answer to any question. A tool for a job.